Masses of 2" flowers bloom early and profusely until frost. 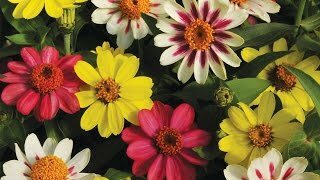 Happy Days Mix adds masses of 2" brilliant yellow, orange and red bicolored flowers to your garden. Plants bloom early and profusely until frost and are carefree and heat-resistant. Marigold, Happy Days Mix is rated 4.4 out of 5 by 9. Rated 5 out of 5 by Trekkingkitty from Fast to sprout My marigold seedlings are still quite small but I wanted to make a comment as to how quickly the seeds germinated using two different mediums. I planted some seeds in starting mix on the back porch. I reused containers from a Burpee seed starting growing system and covered the containers with plastic wrap to retain the moisture. I was very surprised when the marigold seedlings sprouted within three days. On the other hand, I also planted a few marigold seeds directly into a container in the backyard as companion plants for tomatoes. In that full size container I used potting mix. I was very surprised to see that the seeds planted, and covered on the back porch sprouted within 3 days, whereas the ones in the backyard container have not sprouted as of yet. I love marigolds and grow them every year. Looking forward to when they bloom. Rated 5 out of 5 by Candice from Beautiful, Easy, and Came Back Again These were beautiful high yield blossoms requiring nearly no work at all! I love them. They have reseeded themselves as well. Highly recomend them. Rated 5 out of 5 by TerrorSpedMom from Large plants and abundant flowers! I planted this from seed all around our new garden beds to keep foragers off of my vegetable garden and it mostly worked! They kept my garden full of butterflies and bees as well from Spring to late Fall. I am a lazy gardener, so I did not deadhead them which led to quite a bit of legginess as they aged. Also, they were easily killed off by our male dog marking the corners of the garden. Rated 4 out of 5 by Whatnot from Unexpected. And I Hate Marigolds Really. Made me rethink what I thought about marigolds, where you should buy them, and how they should be used. No big box store varieties, never use sparingly but tightly clustered (nothing worse than seeing a solo marigold dressing up some hole in the edging of some local parking lot). Used this batch to introduce my girls to gardening and we dressed up an old monster tree stump. Started fast from seed, slowed down after hardening and planting, lost some to squirrels, and forgot about them (figured they had all been eaten). Then they bloomed late summer after being ignored among weeds around the stump and took over . Wow. They looked great, and perhaps because of the mellow fall, bloomed until Halloween (great Halloween colors in the yard). At the beginning they were excited and I was ho-hum, after they bloomed and fully spread out they were ho-hum and I was excited. Now, I'm not so sure if I want to stick with these or try some others. 4 start since I'm not sure whether the slow start after planting in the yard was the variety or the gardener. Rated 3 out of 5 by lslcurlz from Great last year . . . disappointing this year . . In 2011 these came as a free item - we planted them and they were our most successful plant from seed. We planted them around a young tree and they were lovely all summer. They were AWESOME! In 2012 we planted them again in the same fashion; early and inside in jiffy soil discs and only had perhaps 1 out of 3 discs even sprout. Of the 72 we planted by seed we only had 12 to plant in the garden. Don't know what went wrong. Rated 5 out of 5 by sunshineatlast from fantastic! What an exceptional bunch of marigolds. I started these inside in a sunny window and then put them in my garden in May. I've never seen marigolds grow like these! OK, my garden had good solid and full sun, but still! Each plant grew up be two feet across or more and was covered with dozens of gorgeous flowers up until frost. Unbelievable! Rated 5 out of 5 by CTGardener from tons of blooms Very easy to grow and kids love to plant them right in the ground. Rated 5 out of 5 by Soupy from Long lasting bloom I have planted Marigold Happy Days mix for many years and like the mounding of the plants and the bright colors. They bloom quickly and keep blooming for the whole summer. They are not fussy to grow.